By Michelle Caffrey as seen in the South Jersey Times on February 18. 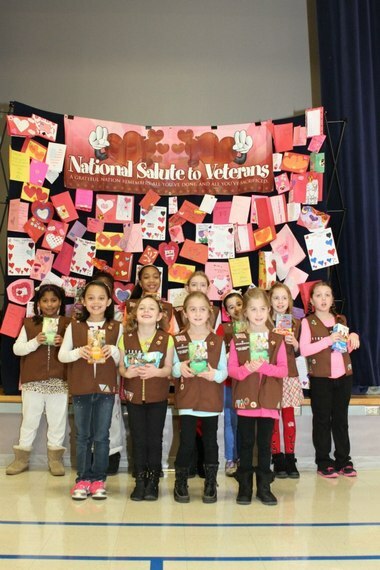 When the second graders in Washington Township’s Brownie Troop 61856 were brainstorming ideas for their annual cookie donation drive, it was easy to agree on where their 160 boxes of Thin Mints, Caramel Delights and Peanut Butter Patties should go — the veterans. Particularly, those that are sick, injured or rehabilitating at the Veteran’s Affairs Hospital in Philadelphia. 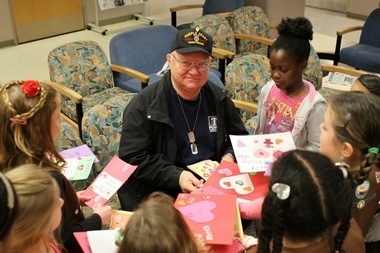 The Girl Scout troop arrived at the hospital on Friday morning, armed with stacks of handmade, pink and red Valentines cards to brighten the veterans’ days, as well as the boxes and boxes of cookies. The girls had a blast as well, she said. Including her daughter, 8-year-old Abby Aguilar. “My favorite part was when all of the veterans smiled and said ‘Thank you,’” Abby said. Abby, like many of her fellow Scouts, were compelled to help the veterans since her two grandfathers served in the armed forces. The troop from Washington Township's visit coincided with National Salute to Veterans week. “They all seemed to have someone in the military,” Aguilar explained, adding that during their drive last year, where they collected boxes to donate to Washington Township’ municipal food pantry “Mother’s Cupboard,” the girls were a bit too young to realize exactly what they were doing and why it was important. “The kids were five or six then, they didn’t ‘get it’ yet,” she said. She was impressed at the difference a year made. The donation happened to coincide perfectly with National Salute to Veteran’s week, and the Valentine’s Day holiday. “It worked out beautifully,” she said. And she said the veterans themselves could not have been more thankful and appreciative to see the young girls truly care about the men and women who sacrificed so much for their country. And when a few more Scouts came by to pile even more Valentine’s Day cards on his lap, Aguilar said he did just that.